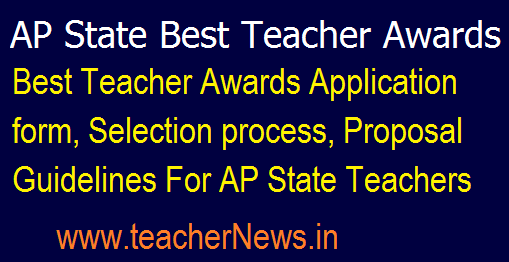 AP State Best Teacher Awards 2018 Application form, Selection process, Proposal Guidelines : AP State Best Teacher Awards 2018 Guidelines has been released by the DSE Andhra Pradesh and DSE Officials are inviting the online applications from the eligible teachers for awarding the state best teacher award in the AP State Teachers. రాష్ట్ర ఉత్త‌మ ఉపాధ్యాయ పుర‌స్కారాలు 2018 కోసం ద‌ర‌ఖాస్తులు How to apply AP State Best Teacher Award Application 2018 Andhra Pradesh Best Teacher Award Application Form 2018 AP State Best Teacher Award Proforma and Points Allotted Table. AP State Award For Teachers Online Application Form 2018 Application Form for State Teachers Award 2018. AP State Best Teacher Awards 2018 -Submission of Proposals Guidelines/ Online Application Form Download. AP State Best Teacher Awards 2018 Submission of Proposals Guidelines Eligibility Criteria & Online Application as per Rc.No:126. AP State Best Teacher Awards 2018 - Submission of Proposals - Guidelines, Criteria, Online Application / State Awards to the Teachers for the Academic year 2018 -2019 Submission of Proposals by the District Selection Committee as per Rc.No.126 dated.17.07.2018. AP State Best Teacher Awards 2018 Submission of Proposals Guidelines Eligibility Criteria & Online Application as per Rc.No:126. All the District Educational Officers in the state are informed that the STATE AWARDS, 2018 to the Best Teachers of Andhra Pradesh are being given every year on the Teachers' day i.e., 5th September. I am to further inform that Awards are proposed to be given to the deserving teachers & Teacher Educators working under the categories at a State Function will be held on 5th September, 2018. The District Educational Officers in the state are further informed that the Teachers have to apply for the State Awards through online in the CSE website www.cse.ap.gov.in. జూలై 31 వ‌ర‌కు ద‌ర‌ఖాస్తు చేసుకునే అవ‌కాశం. రాష్ట్ర ఉత్త‌మ ఉపాధ్యాయ పుర‌స్కారాలు-2018 కోసం ద‌ర‌ఖాస్తులు ఆహ్వానిస్తున్నామ‌ని, ఈనెల 31 వ‌ర‌కు ద‌ర‌ఖాస్తు చేసుకోవ‌చ్చ‌ని పాఠ‌శాల విద్యా క‌మీష‌న‌ర్ కె.సంధ్యారాణి తెలిపారు. ఈ అవ‌కాశాన్ని వినియోగించుకొని ఎక్కువ శాతం ఉపాధ్యాయులు పుర‌స్కారాలకు ద‌ర‌ఖాస్తు చేయాల‌ని తెలిపారు. ఈ మేర‌కు క‌మీష‌న‌ర్ మంగ‌ళ‌వారం పత్రికా ప్ర‌క‌ట‌న విడుద‌ల చేశారు. జతీయ ఉత్తమ ఉపాధ్యాయ పుర‌స్కారాల‌కు ద‌ర‌ఖాస్తు చేసుకున్న విధానం మాదిరిగానే రాష్ట్రంలోనూ ఆన్ లైన్ లో ప్ర‌తిపాద‌న‌లు పంపించుకునేలా కొత్త విధానాన్ని రూపొందించామ‌ని చెప్పారు. తము సాధించిన విజ‌యాలు, వాటి ప్ర‌భావం, ఇత‌ర అంశాలు పూర్తి స్థాయిలో ద‌ర‌ఖాస్తుకు జ‌త చేయాల‌ని ఉపాధ్యాయుల‌కు సూచించారు. జూలై 31 అర్ధ‌రాత్రి వ‌ర‌కు గ‌డువు వుంటుంద‌ని, www.cse.gov.in వెబ్ సైట్ లో టీచ‌ర్స్ కార్న‌ర్ లోకి వెళ్లి ద‌ర‌ఖాస్తు చేసుకోవాల‌ని పాఠ‌శాల విద్యా క‌మీష‌న‌ర్ కె.సంధ్య‌రాణి స్ప‌ష్టం చేశారు. 1. The Academic Standards of the Students. 2. Teaching Methodology being followed by the teacher. 3. Innovation done by the teacher. 4. Special efforts of teacher to improve enrollment, and retention. 5. Sincerity and Commitment towards the job like regularity of attendance, not bringing any political Pressure for transfers etc.,. 6. Willingness to work in Interior areas. One member from outside the Mandal (DIET, Lecturer/Headmaster of Govt./Z.P. H.S). The quorum of the Committee Educational Officer shall enlist the eminent Teachers of Primary/Upper Primary Schools in his jurisdiction and place their particulars before the Selection Committee and send the selected list through online with recommendations containing not more than one teacher for each of the above categories to the District Selection Committee. Senior Lecturer in DIET /Lecturer in College of Teachers Education/ Institute of Advanced Studies in Education Eminent Educationist. The quorum of the Committee shall be two (2) members. The Deputy Educational Officer shall enlist the eminent teachers of High Schools in his jurisdiction and place their particulars before the Selection Committee and send the selected list through online with recommendations, not more than one teacher for each of the above categories, to the District Selection Committee. The Principals of DIETs/lASEs/CTEs /Colleges of Physical Education shall enlist the eminent Teacher Educators under his/her control and place their particulars before the District Level Selection Committee through District Educational Officer, which will select not more than one Teacher Educator for each of the categories i.e., Senior Lecturers in DIETs/lASEs/CTEsand Lecturers in College of Physical Education. AP State Best Teacher Awards 2018 Submission of Proposals Guidelines Eligibility Criteria & Online Application form, Selection process, Proposal Guidelines Download.